This means that the second harmonic is ± 90 deg out of phase with the primary. The sign of the second harmonic gives the sense of AW relative to the core axis and the amplitude is proportional to hH/HD. The fluxgate external magnetic field measurement may be degraded if the sensor electronics cannot produce a primary waveform free of the second harmonic or if residual spacecraft biases are present. A list of operating specifications for several fluxgate magnetometers is given in Table 6-4. Magnetometers in the second broad category are termed "quantum" devices because they utilize fundamental atomic properties in the measurement of magnetic field direction and magnitude. Quantum sensors have been used for experimental field measurements onboard several spacecraft. However, because of weight and power requirements they are not appropriate as attitude sensors on small spacecraft. The simplest of the quantum devices is the proton precession magnetometer. If a hydrogenous sample is placed in a strong magnetic field, it will exhibit a weak magnetic field after the strong field is removed. Further, the induced magnetic field will precess about any external field, H, with the Larmor frequency, yp|H|, where yp is the gyromagnetic ratio [Grivet and Malner, 1967]. Measurement of the resulting precessional frequency then gives a precise measure of the magnitude of the external magnetic field; however, because the magnetic( field direction is unobserv-able, proton precession magnetometers are not used as attitude sensors. A second type of quantum magnetometer relies on a process called optical pumping, which was first reported by Dehmelt . 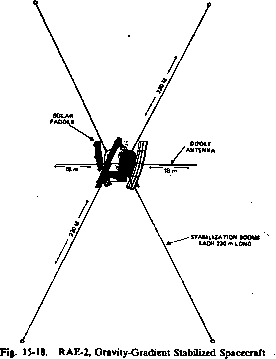 Magnetometers based on optical pumping have a light source producing an intense collimated beam of resonance radiation, a circular polarizer, an absorption cell containing the vapor to be optically pumped, a radio frequency coil to produce-resonance in the pumped vapor, and a photocell to monitor the transmission of light [Bloom, 1962], These optically pumped magnetometers measure ambient magnetic fields as a complicated function of the vapor transparency. Rubidium, cesium, and helium have been used as the optically pumped gas [Slocum and Reilly, 1963]. Optically pumped magnetometers provide both magnetic field direction and magnitude and are generally used as research magnetometers. A rubidium vapor'magnetometer with a range of 15000 nT to 64000 nT and a sensitivity of ±2 nT was flown onboard OGO-I1. It weighed 4.4 kg and required 8 W of power for operation, of which 6 W were required for the lamp alone [Farthing and Folz, 1967], The high weight and power requirements normally prohibit the use of these magnetometers as attitude instruments. (+/-) AXES OUTPUT (measured error) VOLTAGE (mA) Sensor/elec. Sensor/olec.